I live in Northeast Alabama. I enjoy biking, hunting, fishing, canoeing/kayaking and most other outdoor activities, but backpacking is my favorite pastime. I enjoy hiking with friends and family or solo. I hike throughout the year and actually hike less in the hot humid months of summer. My style is slow and steady and my gear is light. However, I will sacrifice weight for comfort and durability. A typical 3-season load for me is around 20 lb (9 kg) not counting food or water. The REI Telus rain jacket is made from eVent fabric. eVent fabric is touted to be one of the most breathable waterproof fabrics available. I'll go over what grabbed my attention here shortly, but for now, here are some of the key features of the Telus according to the manufacture. Highly breathable, waterproof and windproof, the men's REI Telus eVent® Rain Jacket offers the ultimate in protection, performance and comfort for your backcountry adventures. Ideal for aerobic activities in cold, windy, wet weather, such as alpine touring, climbing, snowshoeing and spring skiing; windproof to 60 mph. eVent fabric has a unique membrane that allows sweat vapor to easily pass through the fabric; so you can go all out, yet stay drier and enjoy chill-free rest stops. Strategically placed 2-way-stretch panels enhance movement and performance. Brimmed hood is fully adjustable and allows good peripheral vision. Storm guard behind water-resistant front zipper seals out cold wind; chin guard protects sensitive skin. Pit zips have 2-way zippers that allow fast, versatile core venting. Water-resistant zippers on chest and hand pockets; chest pocket has a cord port. Adjustable hem drawcord and cuffs; angled sleeves extend coverage over top of hands. REI Telus Rain Jacket for men has an active fit that allows a full range of motion. All the zippers on the jacket are the waterproof type. The main zipper on my XL measures about 28 in (71 cm) long. The hand pockets are fairly large, plenty big for a gloved hand along with a few small items like a pocket camera or even a small water bottle. They feel good with my hands in them, and by that I mean my hands feel comfortable inside each pocket and my arms are at a comfortable angle while walking around this way. The Napoleon pocket located on the upper left side measures about 8 in (20 cm) tall and 7 in (18 cm) across. The back side of the pocket appears to made of eVent fabric but there is a hole (cord port) located there so it is not waterproof if dunked. I don't generally use ear buds so I would have preferred it be made completely waterproof since I do spend a fair amount of time in and around water while kayaking down at the lake or just walking along the creek. There is another chest pocket on the other side of the jacket but it is on the inside. It is slightly smaller than the Napoleon pocket but still plenty big for a wallet or cell phone etc. It is mesh lined so it is not waterproof at all. The Telus is made to be the outermost layer so the ability to layer under it is important. For this reason I chose to test an XL size. It fits over a single long sleeve shirt loosely but is not baggy, in fact, I'd say the fit is just about perfect for me. The sleeves are a tad long, but that is pretty much the norm for someone with my stocky build. The hood is rather large, but not so much so that it is easily blown off. I do believe the claim that it allows good peripheral vision is accurate. The fit across the shoulders is a little snug but again, not restrictive. The hem at the waist is adjustable to help keep air out. The draw cord at the hem came let out all the way and I can not tighten it much. The zippers work smoothly even in cold weather and hopefully will do the same when they are wet. The workmanship on this jacket looks like it is top notch. The few visible stitches look tight and the back side of all seams appear to be taped. Here are a couple of photos showing different aspects of the jacket. I have worn it with up to 3 layers so far (a typical medium weight base layer, a fairly thin sweater and a light down jacket) and was pushing the limits of the jackets layering ability pretty far. However, I was very comfortable just standing around in 24 F (-4 C) temperatures so I doubt I will need any additional layers under the jacket 99% of the time. Once I started hiking I quickly went from comfortable to just a little on the warm side. This gave me an opportunity to check out how well the pit zips worked. I thought they helped a little but I did end up unzipping the front zipper before really noticing much cooling. One thing I did discover is that opening the pit zips is easy but closing them proved to be difficult while wearing the jacket. I finally gave up and waited until I arrived down at the creek where I stopped and removed the jacket completely for the hike back up the side of the mountain. I was also impressed with the range of motion the jacket allowed. Not that I am very flexible, but wearing the jacket over the three layers did not feel restrictive. However, upon closer inspection I could not really tell where the stretch panels are located. There is a strip of material about 7 in (18 cm) located along each side of the jacket under each arm. The only difference I could tell between this material and the material on back panel was the color on the inside. It is black on this strip and silver on the back panel and inside the hood. The materiel that goes on around to the front of the jacket (to the zipper) is also black on the inside but is covered with a separate thin mesh-like material. There is another possible piece of the stretch material shaped in a triangle under each arm that continues down the inside area of each arm in a 3 in (8 cm) wide strip. When I was reading the care instructions I noticed another tag that read " HOOD, SLEEVES, FRONT AND BACK PIECING: 100% POLYESTER WITH 100% NYLON BACKING. TRIM PANELS 100% POLYESTER." Anyways, enough about that, I just found the jacket to be comfortable to wear. "WASH ME OFTEN". Sorry for shouting but the jacket started it, and yes, this is in bold print on the care tag. 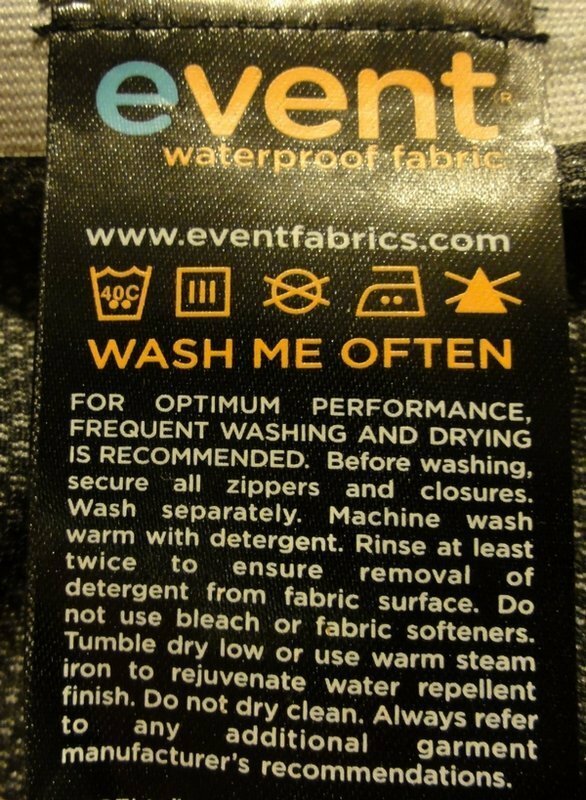 It goes on to say, "FOR OPTIMUM PERFORMANCE FREQUENT WASHING AND DRYING IS RECOMMENDED" . This is followed with detailed instruction but I'll just show the tag and save a lot of typing. I am excited to test a rain jacket made with eVent fabric. It is not the lightest rain jacket I own but it does appear to be fairly durable. I like the many pockets on this jacket and they should come in handy when I want to head out for a short hike and not be bothered with a day pack. When I head into the woods I nearly always carry my cell phone, reading glasses, a pocket knife, a small roll of toilet paper and a bottle of water. I'm also glad to see they can all be closed with zippers so that I can remove and tote the jacket if needed without having to worry about stuff falling out of the pockets. This concludes my Initial Report. I have worn the REI Telus quite a bit over the past two months. Most use was on local hikes here in Northeast Alabama but I did wear it some during a trip to Arkansas. The jacket arrived shortly after the last really cold weather of last winter left but I still wore it at or just below freezing a few times. The coldest testing occurred during the trip to Arkansas when I wore it on a long walk around the Air Force base while visiting my daughter and son-in law. The temperature was about 25 F (-4 C) and it was spitting snow. The wind was also blowing pretty good. Most of my other wearings were on mornings when it was chilly early. I used it on 2 overnights. The low on the first was 44 F (7 C) and the low on the other was 45 F (7 C). I have usually worn the REI Telus over multiple layers but as temperatures warmed over the last month those layers have become fewer and lighter (or perhaps more accurately, less warm). For instance, on the walk around the base in Arkansas I wore it over a light wool sweater and light down jacket. On warmer hike I usually had it on over just a single shirt, whether the wool sweater or one of my cotton flannels. On the first overnight hike it was around 60 F (16 C) as I started my hike so I did not need the jacket on my way to my campsite and only wore it the next morning when I wore it over a light wool sweater. It dropped to 44 F (7 C) overnight. I was camping on the bluff trail about 2 miles (3 km) from home, and while this hike is not quite as strenuous as when I hike down to the creek, it is still almost constantly up and down hill so I worked up a pretty good sweat headed home. I did open the pit zips but I'm not sure how well the eVent Fabric lets moisture escape. My shirt became pretty damp, especially under my arms. However, the inside of the jacket felt dry when I got home. One the other overnight hike I wore it over a tee shirt and a hooded sweat shirt and down jacket. I did not wear it on this hike until around 1 AM. 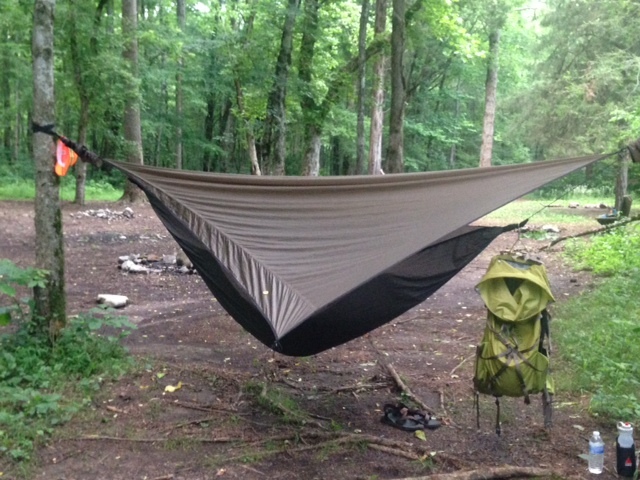 I was testing a sleep system for my hammock that did not include a sleeping bag but rather relied on layering my clothes. Anyways, I had to get up and pee at 1 AM and took this opportunity to add the Telus in anticipation of dropping temps later during the night. I could tell it added some warmth but I still woke up at 4 AM feeling pretty chilly on my back side. It was now down to 46 F (8 C). I took off the ski pants right before heading home but kept the Telus on over my top layers and hiked home using my headlamp. It was 45 F (7 C) when I arrived at the house about an hour later. I had on more clothes than on the previous almost identical early morning hike but I still sweated about the same. This time it was my tee shirt and hooded sweat shirt that got a little damp. My down jacket felt dry to the touch on the inside so it was no surprise that the Telus felt completely dry on the inside. I probably sweated less because I was not working as hard on this hike. 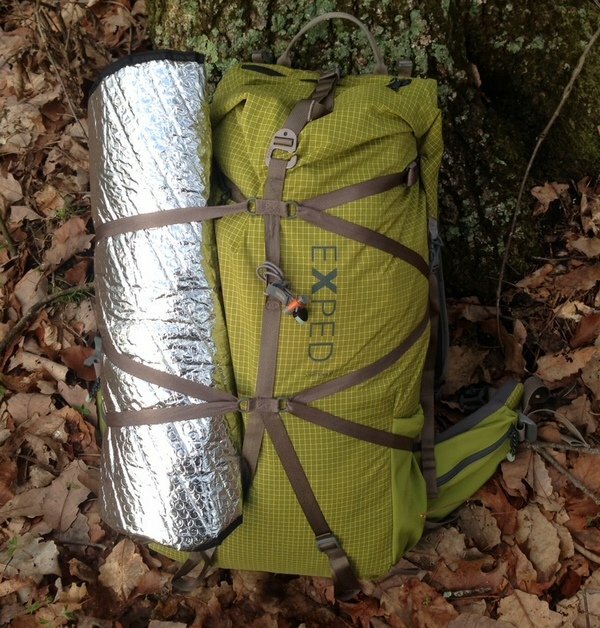 I believe this to be because I was using a smaller and much lighter pack (pictured below) and I had less gear in the pack, a heavy sleeping bag and one less pad for example. I did wear the Telus during some pretty intense rains but non of those times were while hiking. It kept me dry from the waist up and the hood still allowed good peripheral vision. The pockets were also put to good use. My down jacket does not have pockets so when wearing it over that layer it was nice to have a place out of the wind for my hands. The other pockets were used to store various items like my cell phone and car keys and on some of my day hikes I even put a small water bottle in the "hands" pocket a few times. I will say that this jacket could stand to be a little bigger when used over several layers. Or perhaps I could stand to loose a little weight, but regardless, I found the Telus to be a little restrictive when I had on several layers and was doing such activities as putting on my pack. To be fair though, I am spoiled by using a similar wind (but not rain) jacket that is a 2 XL size. The Telus jacket fits about the same as my other XL jackets. One thing I have not had a chance to test much is washing the jacket. I know the care instructions said "wash me often" but I have just not gotten the jacket dirty and have not sweated in it a whole lot. What sweating I did do was pretty much contained by the layers I had on under the jacket. I expect that with warmer weather and wearing less layers I will get the inside of the jacket wetter with sweat and need to wash it more often. Anyways, I have only washed and dried it once so far. This washing did seem to soften the jacket a little but I think it could use a little more limbering up. The REI Telus has done a good job of keeping my upper body dry when worn in the rain. It also kept the wind at bay when worn on some rather cold and blustery days. I don't believe I have really tested the breathability of the eVent fabric enough to make a fair assessment but I have found that I could regulate my temperature pretty easily by opening the pit zippers and then opening up the front zipper as much as needed when needed. The true breathability test will come when I wear it in much warmer weather as a rain jacket. The jacket seems to be very durable and all the zippers have functioned smoothly so far. Overall I have been very pleased with the performance of the Telus! 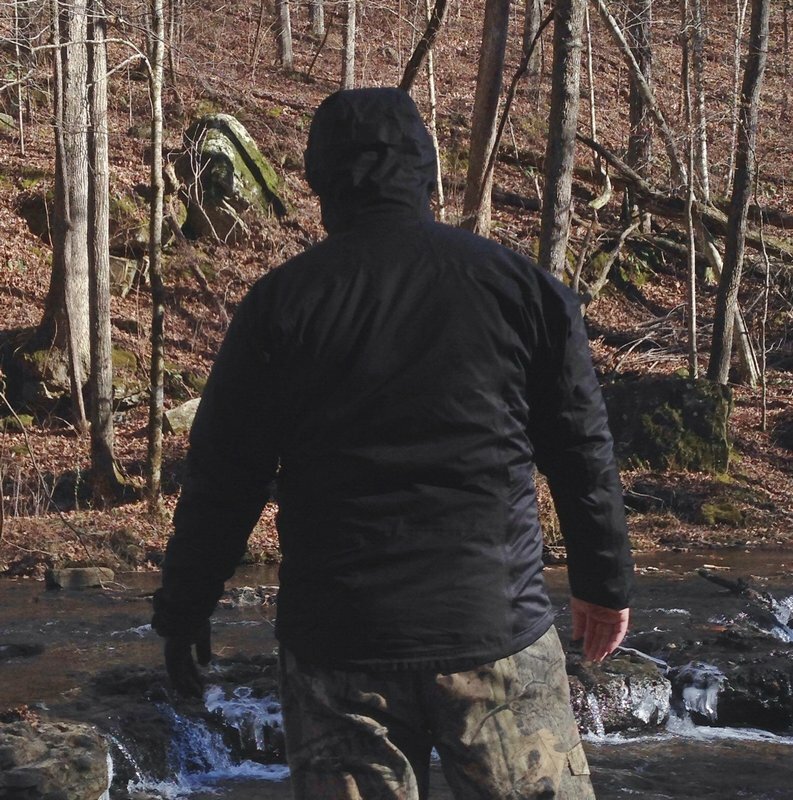 Most of my use has continued to be on nearby trials and around home here in North Alabama, but unfortunately, it has been too warm to need a jacket most of the time. When it has rained it was often during sever thunder storms which I avoided if possible. I carried and wore it a couple of times on a trip to visit my daughter in Arkansas because it rained a little while we were out and about. I carried it on a 7 mile (11 km) overnight hike to the Walls of Jericho but it only sprinkled a little the first afternoon as we hiked in. It was much too warm to wear it unless it absolutely came a downpour. I did wear it one night around 10 PM when we were under a tornado warning while it was pouring rain. I was out in the rain for about 15 minutes. Lows during the last phase of testing have been mostly in the 60s F (16 C) while highs have been as warm as 88 F (31 C). Elevation has ranged from about 600 ft ((183 m) down in the valley around here and the highest was 1800 ft (549) at the start of the hike to the Walls of Jericho. As already mentioned, it has been a little warm to really need a jacket most of the time. The few times I did wear it while day hiking I ended up taking it off soon after getting started. I sweated inside the jacket but I don't think this had anything to do with the eVent fabric not ventilating since I continued to sweat after taking it off. On the night of the tornado warning it had cooled down to around 60 F (16 C). My mom and dad live next door and she has a hard time walking so my wife and I went over to help my dad get her into their shelter. We rode my four-wheeler over in the rain. It has a cab but is open on the sides and the wind was blowing the rain hard enough to wet us inside the four-wheeler. Once inside at my parents we had to go back outside and down several steps to get mom in the storm shelter. We all had on rain jackets but I had my cell phone, head lamp and house keys inside the pockets of the jacket. I found the Telus kept me and the contents of my pocket dry. I was smart enough to bring the four-wheeler around and take her to the front of the house on the return trip but could not get right up to the door of the shelter. And again, once inside the four-wheeler, the wind was still blowing the rain in on us quite a bit. On the overnight hike to The Walls of Jericho I did not carry a sleeping bag so I had the Telus handy in case the temperature dropped lower than my insulating jacket could handle. It never did so the jacket served as my pillow all night. Since I did sweat inside the Telus on several occasions I gave it its second washing. I even photographed the eVent... Anyways, I forgot the instructions that said to wash it by itself but it did not seem to do any harm to the jacket. In light of being energy conscious I imagine I will wash it like this from now on. The REI Telus is a very good rain jacket. I find it hard to qualify just how well the jacket breathes but I do believe it works much better than a non-breathable jacket and the addition of pit zips further facilitated the ability of the jacket to let off steam. It also worked great as a light jacket to knock the chill off when needed. However, I think the greatest benefit of a jacket such as this is it lets me use a light down insulating layer under a much wider range of conditions. For instance, when the down jacket alone was not quite enough to keep me warm, adding the Telus made a tremendous difference. It was like wearing a much heavier jacket. It also let me wear the down jacket when it was cold and rainy. I know I could do the same with a synthetic layer, but I would pay for it in extra weight. I also liked the many pockets on this jacket. I was always able to carry what I needed in the jacket and when I took it off and carried it over a shoulder I could zip the pockets and not lose anything.